When James Dashner first introduced Thomas in the first Maze Runner young adult book in 2009, the amnesic boy had no idea that he was being held for experiments, all in the name of finding a cure for the human race. But that was the crazy road of the Maze Runner book series, produced by Random House and then as a successful young adult movie franchise starring Dylan O’Brien. The storyline felt original, all the characters were compelling and there were a few dark twists to absorb for a Young Adult series. So it’s always bittersweet when a fascinating ya series concludes a storyline, like at the end of the 3rd Installment, which was called the Death Cure. The Gladers find out that some of them were immune to the disease that was wiping out the human race. Then they learned that the Maze was part of an elaborate plan to test children, in the hope of finding a cure. In this third story, there is a reckoning for these experiments. Which version did I enjoy best? Drum roll please….. the young adult book! The biggest change between the books and the movies is the ending. This is beyond changing the ending to be more cinematic versus what can be done with the written word. They changed the entire ideology of the young adult series. In the book series, the motto is Wicked is Good. Wicked was willing to do anything imaginable to find a cure. And they imagined the worst. They put children through experiments which resulted in many deaths. This placed readers on high alert as none of their characters were safe and readers wondered whether a cure would be worth this cost. One could argue that if the goal of the company was to save the entire human race, technically Wicked was good. However that notion conflicted with what the movie business’ need for likeable characters and happy endings. In the ya book, there was no cure. There were only a few survivors who would have to forge forward and start a new society, using the survival skills that were an unfortunate side effect of going through the Maze trials. In the movie, the main character’s blood turned out to be the cure. So not only was he the hero of the story but he had the ability to save everyone. This turned the glimmer of hope from the novel version to survival being only a matter of time in the movie. Another major change was in the two main female characters, Brenda and Teresa. In the books, both women betrayed Thomas for Wicked. Teresa came off more as a sympathetic character as she was manipulated by Wicked and truly loved Thomas. Brenda was survivalist working for Wicked and one of her final scenes was calculating the number of survivors in a fashion that seemed like she was still part of Wicked’s agenda. Both were flawed characters but since Teresa died saving Thomas’ life, I lean towards Team Teresa. However, in the movie, they were portrayed as one being good and the other bad. Brenda’s betrayal was never mentioned and the story went above and beyond to show that she cared for Thomas and that she was an important part of the resistance. To truly emphasis their point, she rescued a bus full of kids. In sharp comparison, Teresa was shown to do things that would turn the audience against her, even though everything she did was to try to save the human race but she did it in a Wicked is Good style. Thus the young adult movie made it very easy to root for Brenda and only forgive Teresa post-mortem. Forgiveness was another key issue in this ya movie. Both Teresa and Gally betrayed the Gladers but they were quick to forgive Gally while the same courtesy wasn’t extended to Teresa. The simplest answer to explain this difference was that Gally was forced to make bad decisions by Wicked, like the murder of Chuck, while Teresa worked for Wicked because she thought she could save the entire human race with their resources. It turns out that neither Gally nor Teresa were bad people but there was no compassion for Teresa. Another reason why I’m Team Teresa. The Maze Runner series has continued with prequel novels but it’s with different characters. As you might guess, the only prequel I would be interested to read would be about Teresa and her journey to betraying the man she loves for the chance to save the entire human race. 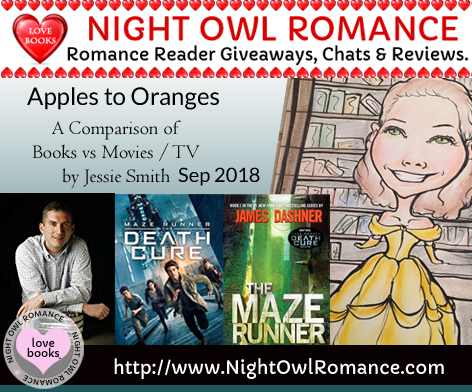 Thanks for joining me for another books vs. movie post.